Design thinking can be seen to have its initial roots in business, especially in product design where innovative products are designed to meet people’s needs and thereby understand how to facilitate innovation. Participatory Design (also often referred to as co-design) looks to actively involve stakeholders, end-users and the wider project team in the design process. As design thinking was extended to the field of management it was extended beyond design outcomes. As it became confronted by ‘wicked problems’ in a management setting, so design thinkers looked to become more systemic. Design thinking and systems thinking complement one another, and their integration via systemic design is already being used by some organisations in their interventions. Design Thinking as a Strategy for Innovation. This page by Linda Naiman shows how design thinking is at the core of effective strategy development and organizational change. It is shown as a methodology used by designers to solve complex problems, and find desirable solutions for clients. Design thinking minimizes the uncertainty and risk of innovation by engaging customers or users through a series of prototypes to learn, test and refine concepts. 5 stages in the design thinking process. 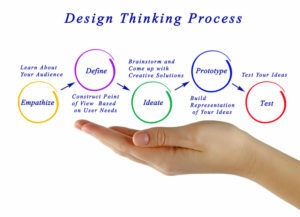 This post by Rikke Dam and Teo Siang highlights that design thinking is extremely useful in tackling complex problems that are ill-defined or unknown, by understanding the human needs involved, by re-framing the problem in human-centric ways, by creating many ideas in brainstorming sessions, and by adopting a hands-on approach in prototyping and testing. Understanding these five stages of Design Thinking (Empathise, Define – the problem, Ideate, Prototype, and Test)will empower anyone to apply the Design Thinking methods in order to solve complex problems that occur around us — in our companies, our countries, and even our planet. Design Thinking: A Unified Framework For Innovation. This Forbes article by Reuven Cohen provides his reflections of the Stanford University “Design Thinking Boot Camp: From Insights to Innovation”course. As he notes, one example of a design thinking process could have several stages: Empathize, Define, Ideate, Prototype and Test. Within these steps, problems can be framed, the right questions can be asked, more ideas can be created, and the best answers can be chosen. The steps aren’t linear; they can occur simultaneously and can be repeated. Systems thinking and design thinking: complimentary approaches? This 2015 paper by Grace Mugadza points out that Design Thinking(DT) and Systems Thinking (ST) came about through totally different and unrelated processes. The philosophies of both can be traced back hundreds of years but there has been a recent resurgence in their application. DT as popularized today has its initial roots in business, especially in product design. More recently it has been extended and applied to management where it assumed many of the concepts of Systems Thinking, which, can be seen to have been developed over a longer period of time. Systems & Design Thinking: A Conceptual Framework for Their Integration. This 2011 paper by John Pourdehnad and colleagues explores the relationship between Systems and Design Thinking. It specifically looks into the role of Design in Systems Thinking and how looking at the world through a systems lens influences design. Co-design resources: techniques and methods. This useful page by Penny Hagen points to a range of industry articles and academic papers that describe, discuss or demonstrate various co-design and collaborative workshop techniques. What is Design Thinking, Really? This 2010 blog post by Venessa Miemis expands on the concept of design thinking as a set of principles, from mindset to process, that can be applied to solve complex problems. It does this through a review of Change by Design, written by IDEO’s CEO Tim Brown. Design thinking diagrams. A 2017 slideshare presentation by Gena Drahun. Provides a wide collection of diagrams illustrating the concept of Design Thinking.